Faculty of Basic Sciences and Humanities, was establishment in Rajendra Agricultural University, Pusa in November, 1981 with the objective to strengthen the teaching and research programme in the disciplines of basic sciences so that it can act as a strong supporting programme for other faculties. Since its inception, the faculty achieved some significant landmarks in different areas. Presently self financed 4 years B. Tech. (Biotechnology) degree programme is being offered since 2006 -2007. In post graduate programme, degree in the subjects of Agricultural Biotechnology, Plant Physiology, Agriculture Statistics and MBA (Agri. Business) is being awarded. Besides committed to academic excellence in Basic Science subjects and maintaining interdisciplinary approaches for Graduate and Post Graduate students, all the departments are actively involved in research programmes in the areas of plant genetic resource management, hybrid rice research, development of heat tolerant wheat varieties, spot blotch disease resistance Molecular characterization, Tissue Culture, Mushroom production technology, and blue green algae (BGA) etc. These projects are funded by external agencies viz RKVY, ICAR, DBT, CIMMYT, AINP, USAID etc. including that from Non-plan budget . To strengthen the teaching and research programme in different disciplines of Basic Sciences and humanities. To train graduate and post graduates in modern biology with particular reference to Agriculture Biotechnology. To conduct basic and applied research in the fields of Agril. Biotechnology and act as a strong supporting partner for other faculties. To generate techno managerial human capital having commitment, confidence, culture and willingness to be Agri-preneurs and having capability to provide leadership role in agribusiness sectors. The college has excellent infrastructural facilities like smart class rooms, seminar halls, internet access in addition to modern laboratories equipped with state-of-the-art equipment/ instruments, to provide proper learning environment. In self financed 4 – years B. Tech. (Biotechnology) degree programme , students are admitted through National level test conducted by ICAR, New Delhi. Against total sanctioned strength of 30 seats. To impart practical training and skill development in Biotechnology there are modern laboratories of Molecular Biology, Genetic Transformation, Biochemical Genetics, Tissue Culture , Microbiology etc. having equipments like Thermo cycler, PCR, Gel Doc Unit, UV Spectrophotometer, Gene Gun, Refrigerated centrifuge, Deep Freezer (-200C and -800C), Micropipette, Vortex shaker, Bioanalyzer, Electrophoresis Unit, Ice flakers, Laminar Air Flow, Gel Dryer, Conductivity meter, Millipore Water Purification Unit, Photo periodic Timer etc. The College has Smart Class Room, Modern Conference Hall, separate Hostel for Boys and Girls with all possible infrastructure including that of Wi-Fi internet facilities. *Students under Department of Biotechnology (DBT), Govt. of India quota are admitted in the PG programme through JNU competitive test conducted on all India basis. Seats under the University quota are filled up through entrance test conducted by ICAR. 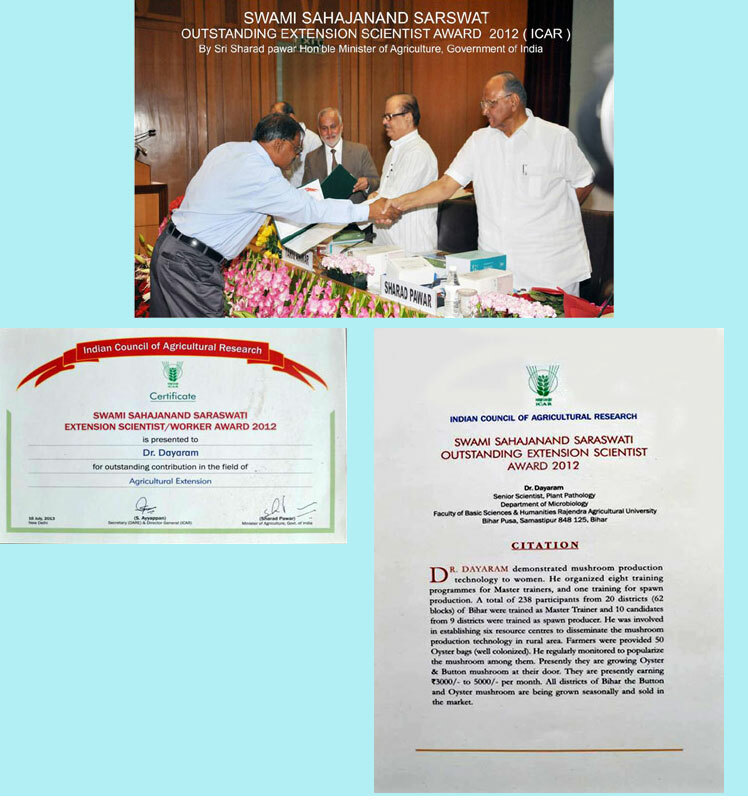 16 Application of micro organism in agricultural allied sectors 5 Year ICAR Agri. Biotech. Popularized the mushroom production technology through training on mushroom cultivation, spawn production, demonstration and display in Kishan Mela, Krishi ghosti, Villager’s site, mass media , through pamphlets etc. Developed human resources pool on mushroom cultivation and spawn production in the state. Technical guidance to trained personal resulted in the establishment of spawn production unit at Barauni, Vaishali, Gaya, Nalanda, Patna financed by SIDBI & NHB (Govt. of India). Mushroom spawn lab have been established in different KVK’s namely Banka, Munger, Sariya (Muzaffarpur) and Piprakothi in East Champaran. Established a networking of mushroom growers for proper technical advice, marketing and organized mushroom farming. Learning materials on mushroom production technology was developed and distributed to the users community. 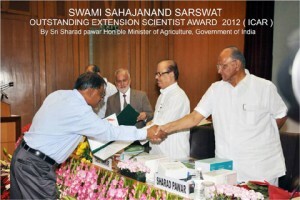 Swami Sahajanand Saraswati outstanding extension scientist award (ICAR) was conferred to Dr. Dayaram, for his excellent achievements in popularization of mushroom cultivation.